One of the most ballyhooed astrophysics findings in recent memory has come under fire recently. In March, a team of researchers announced that they had found evidence of primordial gravitational waves, ripples in space-time from the universe's earliest moments. But other scientists have already begun questioning the discovery, suggesting that it may simply be the signature of dust in our own Milky Way galaxy. However, he added, "there is no statistical evidence for the claim that gravity waves have been seen." Most scientists think that in the first 10-35 seconds — roughly one-trillionth of a trillionth of a trillionth of a second — after the Big Bang, the early universe experienced a rapid expansion known as inflation. In this brief moment, space-time exploded outward far faster than the speed of light. The universe continues to expand today, but at a far slower pace. Strong evidence for inflation can be found in the cosmic microwave background radiation (CMB), the light left over from the Big Bang. Temperature variations in the CMB, which pervades the entire sky, are minor, suggesting that the universe initially came from a small region of space, researchers say. Spergel compared the relative uniformity of the CMB to teaching a class in which all students hand in identical exams. "That suggests there has either been communication in the room, or some information shared at the beginning," he said. If information were shared across space-time to maintain similar conditions, it would have to travel almost instantly across vast stretches of the universe, a process most scientists consider unlikely. Inflation would have left its mark on the CMB in the form of gravitational waves, distortions in space-time, the idea goes. 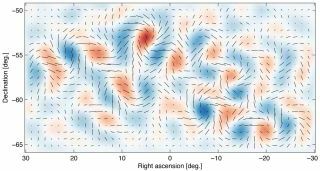 Teams of researchers around the world have thus been searching for "B modes," a type of polarization in the CMB predicted to be generated by primordial gravitational waves. The sun sets behind BICEP2 telescope in the foreground. The South Pole Telescope stands in the background. Spergel said that, on hearing the news, he was "excited but doubtful about the results." His initial trepidation arose from the fact that the measurements made by the BICEP2 team were only taken in a single-energy frequency. Spergel asserted that at least three frequencies are required for a solid detection. Observations in a single band can set limits on gravitational waves, but "it's very difficult to make a convincing detection," he said. Another issue with the reported detection stems from the fact that dust in the Milky Way galaxy can scatter microwaves, creating a similar polarization pattern as that produced by gravitational waves — an effect that can be subtracted out. "Dust has turned out to be an even more pernicious problem than many of us thought years ago," Spergel said. The BICEP2 team made their measurements in one of the most polarized regions of the sky, and Spergel contends that the researchers didn't sufficiently subtract out the contribution from foreground dust emission. The BICEP2 team estimated that only 3.5 to 5 percent of the dust in the sky is polarized, but a large fraction of the sky suggests that the actual polarization figure is above 7 percent, Spergel said. "I think it is optimistic to assume the polarization is much less," he said. Spergel is not the only scientist to express doubts about inflation's "smoking gun." Since its release, the BICEP2 results have come under a great deal of scrutiny from other scientists. But whatever ends up happening, Spergel says the findings are important and will help scientists further understand gravitational waves. "The BICEP measurement will be a very important measurement at 150 Gigahertz," Spergel said, referring to the frequency of the 512 detectors responsible for capturing the data. The finding also illuminates an important lesson — the need to validate a result at several different frequencies, which would provide more robust evidence for detections from the early universe. "We are entering a very exciting period of time for cosmologists hoping to detect gravity waves," Spergel said. "I think the BICEP team should be recognized for having made a very sensitive record, for pushing the field forward."